We went to one of our favorite places, Robinson Park in Llano and what a trip it was. 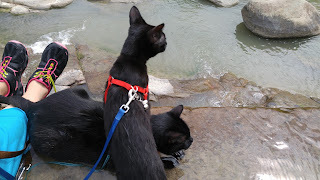 We took a walk on the water wall. 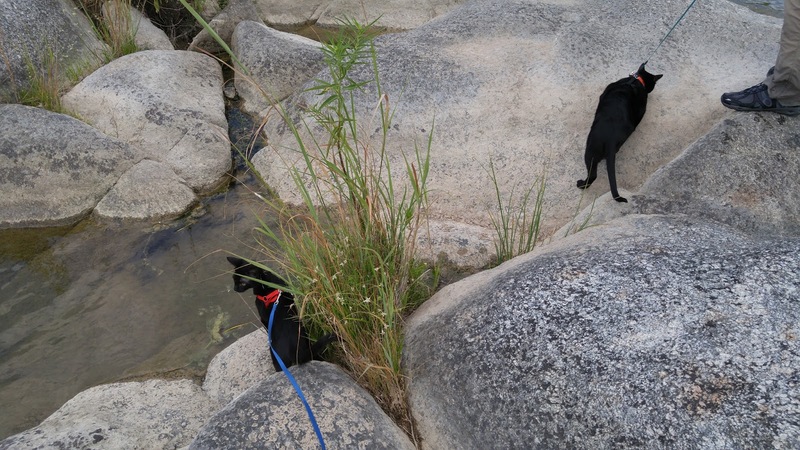 I have learned water walls are great fun because I can walk around and know I am safe. I made sure to show Stealth everything that was happening. Now since we have two cats we needed two comfy spots. 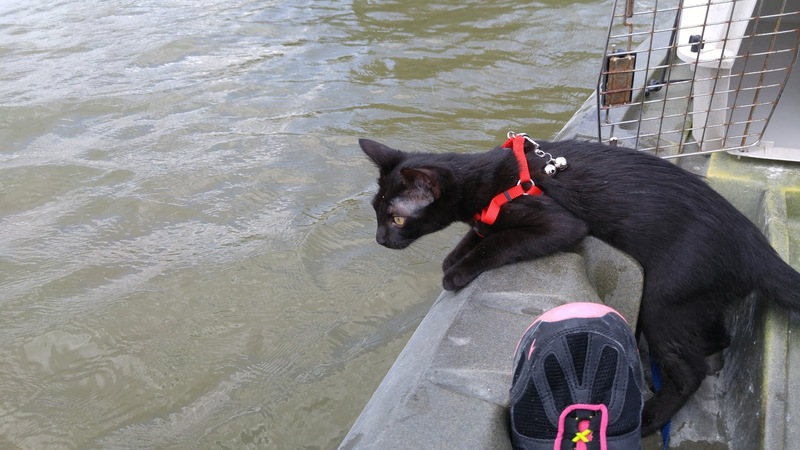 My people found a comfy spot that fits purrrRRRrrrfectly on the he types kayak so they gave that to me and I got to sit and enjoy all the happenings of the day. Stealth took my comfy spot on the she types kayak. 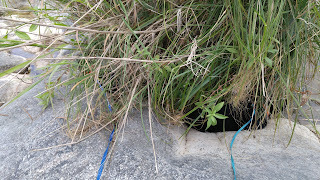 We had our lunch and time of exploration. Then my very favorite time of the day. Hide and sleep. I have learned to play this game with the humans on occasion when they go to eat their lunch. 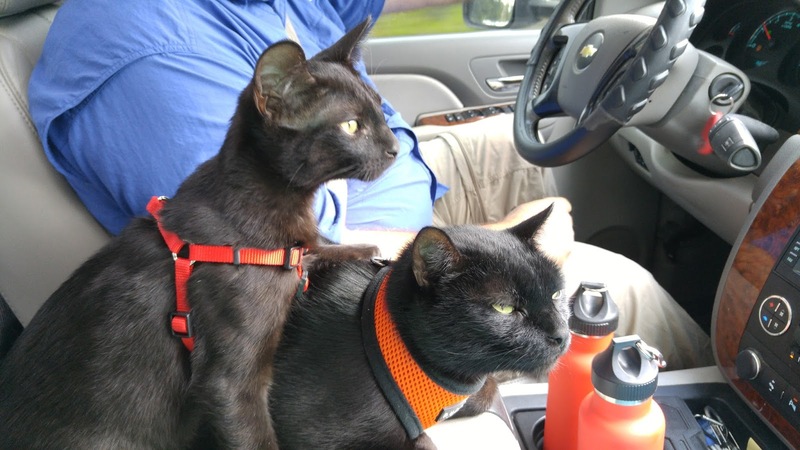 They had the audacity of putting bells on our harness so they would hear where we are. Humpffffff. Stealth only jumped off the kayak toy twice and both times was trying to get to my kayak toy. He did make some spectacular jumps and only ended up in the water a few times. Maybe he thought we were going to leave him, what a silly kitty he can be sometimes. The day was a beautiful day to be outside for an adventure. What fun! 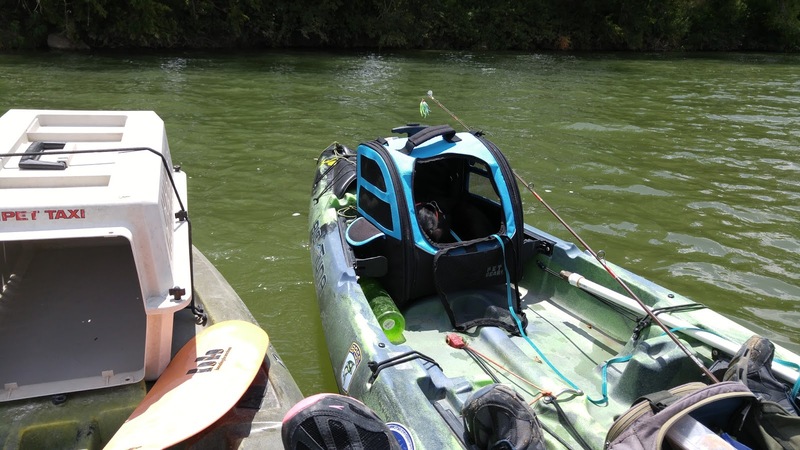 Having carriers on the kayaks is a cool idea. I'll have to keep that in mind next time we go canoeing! The carrier is what finally made the kayak a "fun" place to be. It is safety when just about anything happens. The cozy place "carrier" is kept in the house so it is used as a napping spot and thought of as safety and cozy. You two are so inspiring! I don't kayak but I'd love to take Christy on more adventures. Happy Black Cat Appreciation Day to you both. Oh, I will take any adventure, some of my adventures are walking on a leash outside our house. Just to be outside in the grass makes me purrrRRRrrr. Looks like you had tons of fun with Stealth! You are both very brave as I don't think our kitty Rosie would be so brave. P.S. : Happy Black Cat Appreciation Day! Thank you. It does take working up to the bravery part. Stealth was crawling all over me because he was so nervous. MOL! I'm glad you are getting along better! What wonderful adventures you're going to have!!!! We're glad to hear Stealth is getting the hang of it. I am glad you have a brother now to share the fun with on adventures. What a PURRfect adventure! Stealth is lucky to have a fur friend like you to show him how to be brave!